In another round of feature enhancements and additions, Microsoft Azure got a major set of updates in the form of a revamped marketplace and advanced networking capabilities. First in line is Azure Marketplace, an exchange that connects cloud solution providers with customers. With over 3000 listed products, Azure customers can launch a variety of workloads with a click of the button. The catalog consists of latest Microsoft servers including Windows Server, SharePoint Sever and SQL Server. It also has many open source software products including SUSE Linux, Ubuntu Server and Apache Solr. Apart from virtual machines that can be launched directly on Azure, the marketplace also has 3rd party SaaS offerings like SendGrid, New Relic and Twilio. 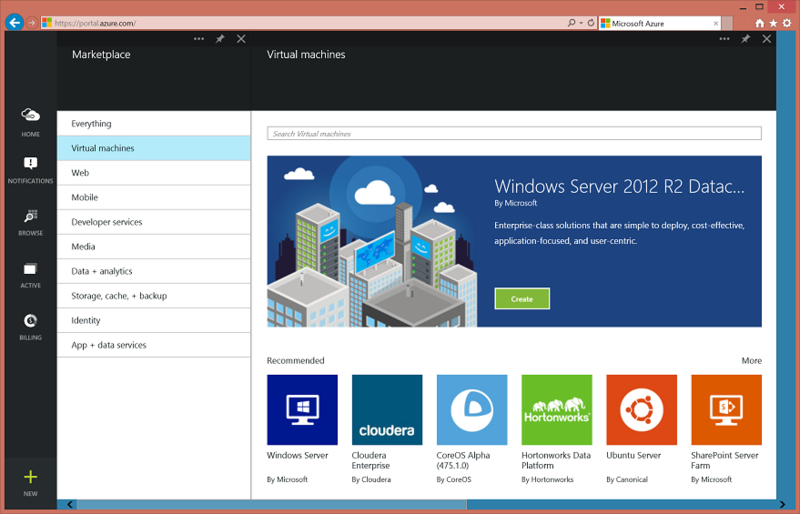 The portal acts as a one-stop shop for developers and customers building solutions on Azure. CoreOS, a lightweight Linux OS that runs clusters of Docker container, is launched on Azure through the Marketplace. Though Microsoft has a native Hadoop service on Azure called HDInsight, it now supports other distributions including Cloudera. Unlike other available cloud marketplaces that only enable provisioning of VMs running the product, Microsoft made it simple to launch multi-tiered applications that run on multiple VMs on Azure. Microsoft may be consolidating two of its existing marketplaces, data market and VM depot. Azure Automation Service, enabling the creation, deployment, monitoring, and maintenance of resources on Azure, is now generally available. This service is used to orchestrate time-consuming and frequently repeated operational tasks across Azure and third-party systems. Based on PowerShell, Azure Automation service provides an environment to automate a wide range of scenarios including the creation, deployment, monitoring, and maintenance of resources in the cloud. Along with this Microsoft also announced the general availability of Antimalware, a free service that provides endpoint protection on the cloud. Microsoft also announced Azure Batch Service, which provides “job scheduling as a service” with auto-scaling of compute resources, which is meant to make it easier to run large-scale parallel and high performance computing (HPC) in Azure. Microsoft integrated the intellectual property that came via the acquisition of GreenButton, a HPC company. According to Scott Guthrie, executive vice president of Microsoft Cloud and Enterprise group, this service can be used in calculating risk for banks and insurance companies, designing new consumer and industrial products, 3D animations, and video transcoding.